On foot and at sea, we feel small and insignificant – just as we’d hoped to. Escape the big cruise lines and crowds of tourists on a small-ship adventure through Southeast Alaska’s remote coastal wilderness. Witness ice-capped mountains rising 15,000 feet from the sea and mazes of fjords carved out by ancient glaciers – all inside the world’s largest temperate rainforest and travelling with highly experienced expedition leaders who are among Alaska’s most outstanding guides. Hundreds of islands dot the Inside Passage, the sheltered saltwater route that rests between the open Pacific and the Coast Range. 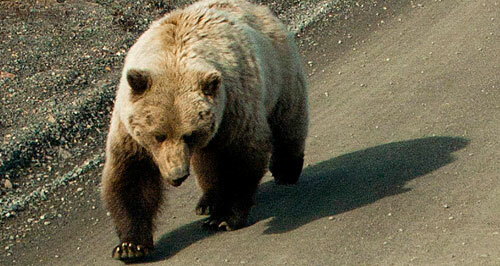 Bears, whales, seals and eagles rule this uninhibited environment, where human presence is slight. With this package, you’ll explore remote islands and tranquil coves that big cruise ships just can’t reach, for intimate encounters with whales, porpoises, sea lions and sea otters – and with rare close-up views of black and brown bears in their natural habitat at Anan Creek Bear Observatory, as they fish for spawning salmon. Savour privacy and solitude aboard our luxurious small ship, which carries just 20 guests – in contrast to the 3,000 or more aboard many cruise liners. Our vessel’s small size means we offer an immersive wildlife-focused itinerary you won’t find anywhere else. We have access to narrow channels and secluded coves that are off-limits to larger ships, meaning you’ll visit remote wildlife sanctuaries that few other visitors get to see! At Anan Creek near Wrangell – virtually unvisited on most commercial trips – we have a chance to look for both brown and black bears as they hunt, catch and feastduring Southeast Alaska’s largest pink salmon run. Our ship’s special permits allow us to spend the night within Glacier Bay itself – a privilege afforded to very few vessels, and none to big cruise ships. What’s more, we’ll have a Glacier Bay National Park ranger on-board to guide us through and explain the Bay’s natural wonders, with lots of time leftover for personal conversation. Frederick Sound is home to some of Alaska’s largest populations of orcas and humpback whales – and the humpbacks here are known to exhibit an especially high level of breaching behaviour, often leaping completely out of the sea. • Multiple Kayaking Excursions – Included! With an onboard fleet of stable sea kayaks, you can paddle through the ocean alongside Dall’s porpoises, sea otters and puffins. On a typical cruise, you might have a chance to purchase a kayaking excursion at a single port, lumped into the water with a hoard of other passengers – but our small ship carries its own kayaks, which we have the option to use in various locations throughout our voyage. 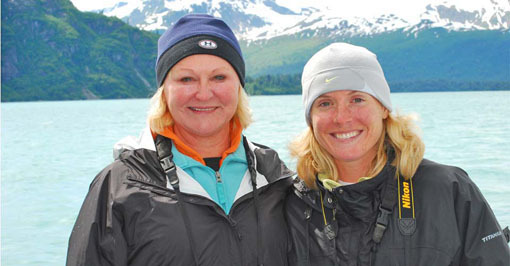 You’ll travel alongside our own NHA Expedition Leaders, seasoned naturalists who are among Alaska’s most outstanding guides. Our ship, The Safari Quest, is a stylish luxury yacht accommodating 20 guests and two Expedition Leaders in 11 staterooms. Built in 1992 and thoroughly renovated in 2006, this yacht is 120 feet long and boasts four spacious decks, with four stateroom categories. The Safari Quest offers both double and single accommodations, and all staterooms come with private en suite bathrooms and showers (with heated tile floors). Guests may visit the casually elegant salon to recap the day’s activities or watch a movie on the widescreen TV; the onboard library offers a quiet space for reading or journaling; and the yacht’s fully stocked bar is at the ready with your favourite brew. There is a topside hot tub on the sun deck for those wanting to relax, and fitness equipment is also available on board. A full-beam swim step allows for easy access to water activities. Onboard adventure equipment includes kayaks and stand-up paddle boards, inflatable skiffs, hiking poles, fishing rods and tackle, and hydrophones for listening to below-surface sounds. A 2:1 guest-to-crew ratio ensures highly personalised attention to passengers’ every need and comfort. • Category 1: Mariner Staterooms: Cabins C1 (1 queen bed), C2 (1 queen bed), C3 (1 queen or 2 twin beds), C4 (1 king or 2 twin beds), C6 (1 queen). These rooms are on the cabin deck and include elevated port lights (not suitable for viewing). • Category 2: Commander Stateroom: Cabin B2 (1 queen bed). This room is on the main deck and has a view window. • Category 3: Captain Staterooms: Cabins A1 (1 king or 2 twin beds), A2 (1 king or 2 twin beds), A3 (1 queen bed), A4 (1 king or 2 twin beds). 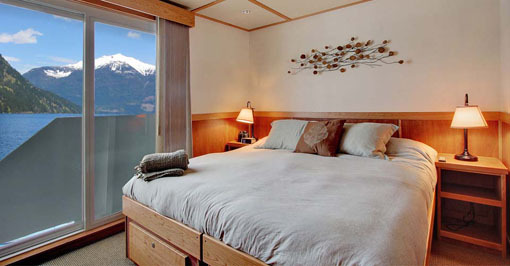 These cabins are on the bridge deck and include a sliding glass door which opens onto a small balcony. Accommodation, meals from dinner on Day 1 to breakfast on final day, purified drinking water, services of NHA Expedition Leader, local guides and boat crew, airport transfers in Juneau or Ketchikan on Day 1 and final day, some gratuities, most alcoholic beverages, all permits, entrance fees and taxes. Travel to and from start and end point of trip (Juneau and Ketchikan), most gratuities, some alcoholic beverages, passport and visa fees, items of a personal nature (phone calls, souvenirs, etc. ), airline baggage fees, airport and departure taxes, optional travel insurance. Easy to Moderate / Flexible This adventure does not require a high degree of physical fitness although, should you choose to participate in every activity, you will be required to climb into and out of skiffs and kayaks from the yacht. Please be prepared for water landings and a series of short walks over potentially wet, muddy, uneven terrain. Kayaking will be an option available to guests. It is easy to learn, and we expect that most of our guests have little or no experience. It does, however, take an adventurous spirit. • Arrive in Juneau, the most scenic state capital in the United States. 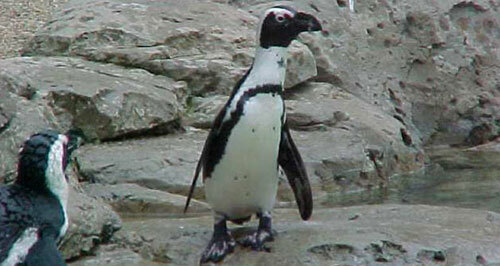 • You will be met at the airport by our representative who will accompany you to our private yacht, the Safari Quest. • Welcome aboard with the captain and crew and a toast of champagne. 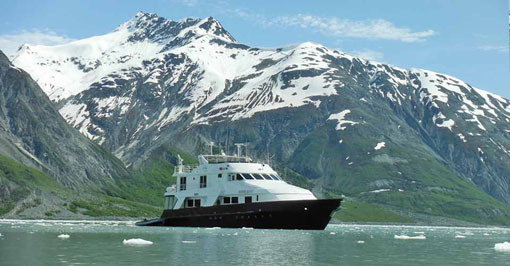 • Depart for the scenic channels of the Inside Passage, relaxing with hors d’oeuvres and cocktails as you get to know your new shipmates. 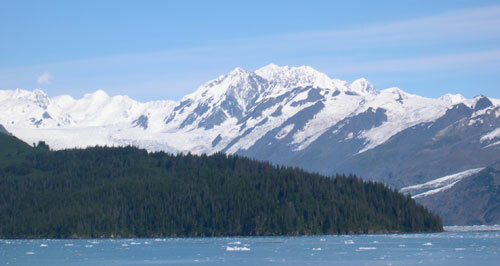 • Accompanied by a park ranger, spend the next two days exploring Glacier Bay National Park. 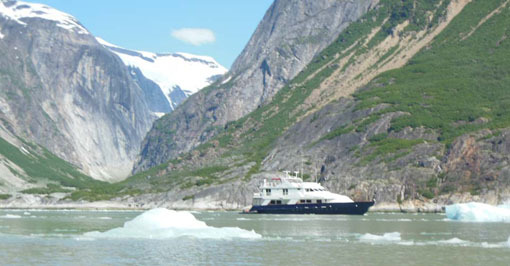 • Travel to the head of the bay to spot Steller sea lions basking on the rocks or watch Dall’s porpoises swimming in our bow wake as we cruise up Tarr Inlet to the Margerie and Grand Pacific glaciers, which rise 250 feet above the surface of the water, with another 100 feet invisible below. • If conditions permit, we’ll lower the skiffs and weave among the floating bergs. • In the morning, join our Expedition Leader to paddle kayaks in the silence of this pristine 3-million-acre wilderness. 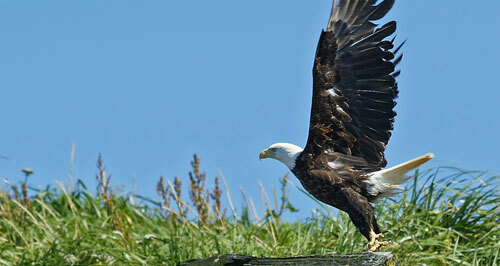 • Amid the ancient Sitka spruce and yellow cedars, we may spot moose, mountain goats, black bears and eagles. • Join the captain on the bridge or our Natural Habitat Expedition Leaders and the ship’s naturalists out on deck as we cruise in search of marine mammals. • Later this afternoon, we’ll drop the skiffs and kayaks, exploring the shore for possible bear sightings. • In the evening, relax in the hot tub on the upper deck, or enjoy a nightcap with your fellow travellers in the salon. 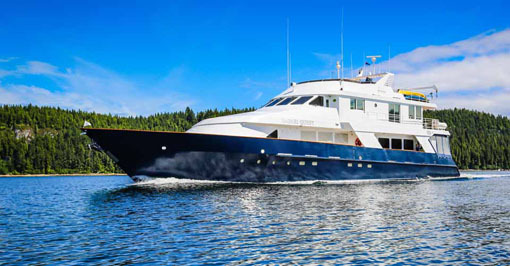 • Cruise the coastlines of Kuiu and Baranof islands in the northern Alexander Archipelago, rich in indigenous Tlingit culture and Russian exploration heritage. • This evening there will be opportunities to explore by skiff, go beach-combing, trek ashore with an Expedition Leader, or look for sea otters and bears from the kayaks before tucking away in a waterfall-laced fjord. • We’ll slip into one or two secluded coves to explore by skiff, paddle a kayak, or enjoy a guided hike. • The sound is a popular place for whale watching, offering some of the best sightings of humpbacks and orcas in Southeast Alaska. 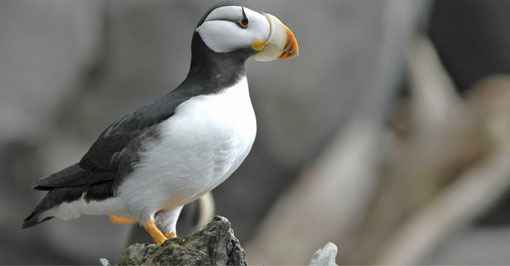 • Keep watch along the coastline, too, for wolves and bears,loons, puffins, guillemots and marbled murrelets. • Pass through the Wrangell Narrows, a narrow, snake-like 22-mile channel dubbed “Christmas Tree Lane” for its many red and green navigational lights. • Anchor in Wrangell Island, from which we commence a walk, led by local guides, to the Anan Creek Bear Observatory. • Watch the bears below, vigorously fishing for spawning salmon. While we do see brown bears here, Anan is known mostly for its prolific black bear population. • A photography blind is available, allowing for close-up photos at eye level. • Reach Ketchikan, Alaska’s most southerly city, famed for its fishing, forestry, heavy rainfall and rich Native heritage and arts. • Share a farewell breakfast together before disembarking the yacht. A transfer is provided to the Ketchikan airport. Please note: The itinerary provided is meant as a guideline, and is subject to change without notice. On rare occasions, it may be necessary to deviate from our regular itinerary for reasons beyond our control. In these instances we will provide the best available alternative. Alaska is the largest state in America but also the least densely populated, situated at the extreme north-west corner of the American continent. The Inside Passage is a coastal route which weaves through the islands of the Pacific Coast of North America in south-east Alaska. The Alaskan portion of the Inside Passage extends for 500 miles from north to south and for 100 miles from east to west. The Passage is relatively sheltered and protects ships from the bad weather of the open ocean. There are 15,000 miles of shoreline and thousands of bays and coves. The climate is maritime with temperatures milder than the latitude might suggest. 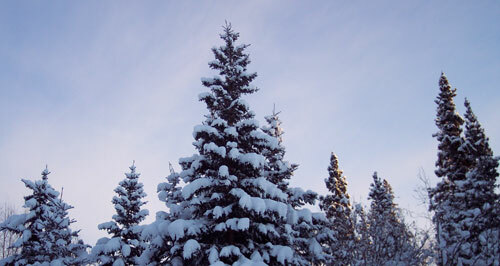 Spring, summer and fall are cool to mild and the average low temperature in January is -5 C. South-east Alaska is noted for its scenery – the majority of South-East Alaska is in the Tongass National Forest. 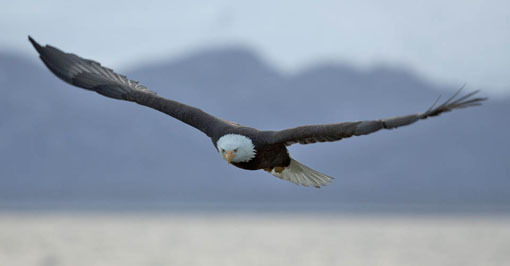 Wildlife includes brown and black bears, deer, whales, salmon, eagles, ducks, and marbled murrelets. The area is the traditional home of the Tlingit people. Art and spirituality are incorporated in all areas of Tlingit culture. Accommodation and meals from dinner on Day 1 to breakfast on Day 8. All activities as per itinerary. 7 nights’ accommodation on board The Safari Quest.